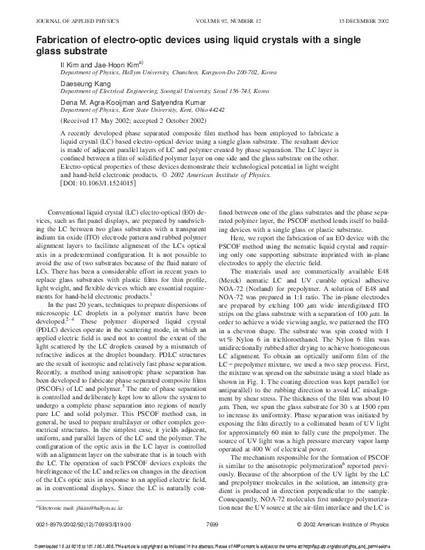 A recently developed phase separated composite film method has been employed to fabricate a liquid crystal(LC) based electro-optical device using a single glass substrate. The resultant device is made of adjacent parallel layers of LC and polymer created by phase separation. The LC layer is confined between a film of solidified polymer layer on one side and the glass substrate on the other. Electro-optical properties of these devices demonstrate their technological potential in light weight and hand-held electronic products. Copyright 2002 American Institute of Physics. This article may be downloaded for personal use only. Any other use requires prior permission of the author and the American Institute of Physics. The following article appeared in J. Appl. Phys. 92, 7699 (2002) and may be found at http://dx.doi.org/10.1063/1.1524015.